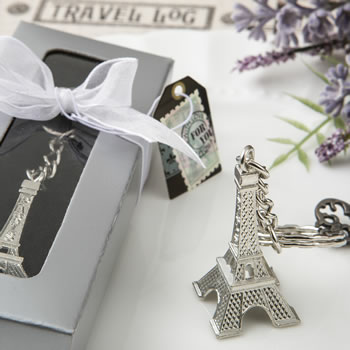 Each Eiffel Tower charm measures 1.5? x .75? (total size of favor including chain is 4? long). 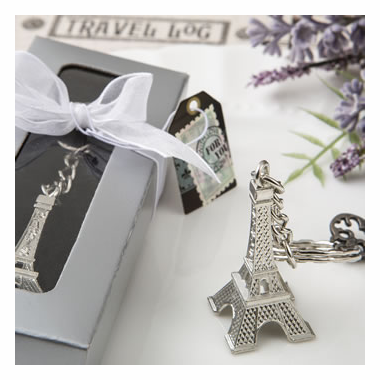 This is a detailed silver metal Eiffel Tower replica, with the word France printed on its side, is attached at its top through a stationary ring to a sturdy silver metal chain and key ring. Each is packaged in a silver two piece box with a central cut out window top and is finished with a white organza ribbon and an attached tag with the message ?From Paris with Love? in a postage stamp design.